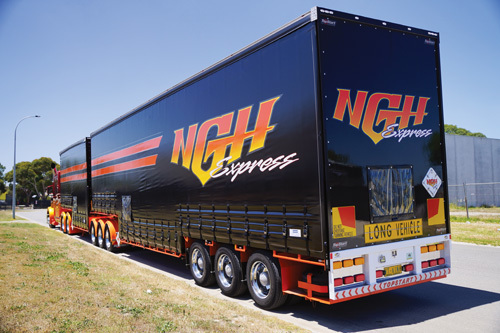 NGH Express has developed what it calls the ‘NGH Spec’, a set of particularly robust components and features that it knows can handle the gruelling route across the Nullabor. One that made the cut is the eLeg from Razor and Fuwa K-Hitch. When Bryan Adams sang that “Only the Strong Survive” in 1987, his lyrics championed the value of mental strength in overcoming adversity. However, the concept also translates accurately to a physical level, especially when it comes to trailer building – for equipment to last, it has to be able to stand up to its environment. The sentiment rings true to those who travel on the coarse and uneven roads that cross the famous Nullarbor plains on the East-West route from Melbourne to Perth – a path that is the daily reality for NGH Express’s fleet of 11 trucks and 30 trailers. Although the general freight fleet now has robust collection of equipment, Nathan Godfrey, Owner/Director of NGH Express, admits that he has gotten it wrong in the past. “We’ve certainly learnt a lot from buying the wrong stuff. It gets more complicated with trailers than with trucks, because there isn’t really a standard spec. 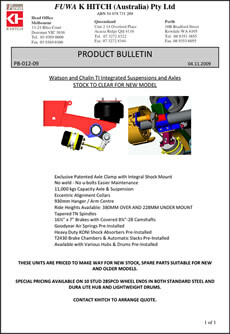 So I took things into my own hands and developed what I call the ‘NGH Spec’,” Nathan says. Nathan says it’s “really important” to have open conversations with trailer manufacturers and component suppliers to make sure equipment will be able to handle abuse from the roads or other environmental factors such as heat. “I go and see a trailer model and pick out all the weak points, then the manufacturer re-engineers it to match what I need. Topstart has been really good in that way – it builds whatever I want, however I want it,” Nathan says – revealing that the most recent trailer he has designed with Topstart is a 36-pallet double drop deck B-double delivered in December last year. The new trailer set is a prime example of the NGH Spec, Nathan says, boasting tough floor to roof gates, thick outside curtains, a Teflon-topped turntable, 11-tonne pre-cambered axles with parallel bearings and his third set of eLeg automatic landing legs that are fitted to the A-trailer. “While I was re-designing the NGH Spec with Jimmy at Topstart, Colin Himmerman from Fuwa K-Hitch suggested I try the new automated landing leg that it was developing with Razor International. He’d previously suggested a sturdier axle to replace what I was using, which worked out really well, so I was confident to give the eLeg a try too,” Nathan explains. Razor’s co-Managing Director, Geoff Watson, agrees that the eLeg holds up to the standards for the NGH Spec. “The eLeg has a robust, yet compact solid aluminium gearbox casing, and has undergone extensive testing to ensure it will be a valuable part of the NGH Express fleet,” he says – adding that the eLeg builds on Razor’s proven electronic landing leg technology. The eLeg also does its part in preserving the strength of the NGH Express longhaul drivers, who already have enough fatigue management concerns without wearing themselves out manually operating landing legs. “As a business owner, you’ve got to think about workplace safety: anything to make life safer for the staff is a priority. In our case, that means removing the need to manually wind landing legs to protect drivers from back injuries,” Nathan says. According to Colin, Nathan’s description reveals the main benefit of the eLeg, as it is all about improving OH&S. “It’s so easy to operate, and it’s not hard on the shoulders and arms of the operators because there is absolutely no labour involved. The drivers can save their energy for other, more important things,” he explains. “The eLeg is operated with a push button and simple high/low range gear lever, so the driver just has to hold the button and the legs will operate by way of the directional buttons. Taking care of his staff is incredibly important to Nathan, especially as the number of NGH Express employees continues to increase in alignment with the company’s growth. “Now I have about 14 staff members, including drivers, office staff and mechanics. The business has come a long way since I bought my first truck,” he says. Similarly to the NGH Express fleet, the trailer and component markets have evolved dramatically since the Canadian singer Bryan Adams released ‘Only the Strong Survive’ in the late 1980s. However, the requirement for hardwearing equipment is still the main constituent for the ‘NGH Spec’ and a widespread part of the Australian transport industry that isn’t likely to change. Fast Fact: Displayed at the 2014 IAA Commercial Vehicles Show in Hanover, Germany, the first order of the fully automated landing leg was delivered to Vawdrey Australia in April last year. “This is a monumental feat, as it has taken Razor and Fuwa K-Hitch three years to commercialise the product,” says Razor’s co-Managing Director, Geoff Watson, who adds that the eLeg has the potential to ‘revolutionise the transport and logistic industry’.